Experts have been predicting that this winter will be colder than average, producing some lengthy cold periods and periods of snow – which means teams will be out all over the region ensuring our roads are kept clear. Research has shown that for every £1 expended on winter road maintenance, about £8 is saved in the economy as a whole. But where does it come from? UK produced road salt comes from mines based in Cheshire, Cleveland and Northern Ireland. These contain vast reserves, sufficient for many years to come. Road salting is extremely high-tech: winter maintenance professionals are highly trained to ensure they are spreading just the right amount of salt. They also have sophisticated support tools including thermal mapping, road weather information, GPS tracking systems and very sensitive spreading vehicles that can be finely calibrated to alter the spread rate. • Ensure that your journey is necessary, allow plenty of time and put safety before punctuality. • Clear all windows of snow and ice using de-icer and a scraper – do not set off with just a tiny hole cleared in the windscreen. • Avoid harsh braking and acceleration or sharp steering – Chances of skidding are much greater in icy conditions. Brake gently to avoid skidding. If your wheels start to lock up, ease off the brake. • Always reduce your speed – Increase the gap between you and the vehicle in front. You may need up to TEN TIMES the normal distance for braking. 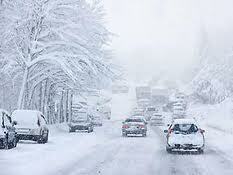 • Be especially careful – on bridges, overpasses and infrequently traveled roads as these freeze first. At temperatures above freezing, if the conditions are wet, you might still encounter ice patches. What Is a Healthy Salt Intake? Do You Have Enough Salt in Your Diet?